It was early as I packed my bags on Sunday morning to leave for Chokladskolan, thinking to myself that surely today’s course can’t be as long as the other one. I left the small hostel and walked my way towards the school, all while my heavy bag constantly tilted over because the wheels on it it’s on the wrong side and therefore it’s very unstable. I left in very good time but managed to only just get there on time. We didn’t have much theory today, most of it was going to be hands on experience. I said in my last entry about Chokladskolan that the second course was hectic, and this one was more so. Since we left late the day before the people from yesterday’s course had to do the dishes from yesterday while the new people were assigned tasks; making the praliné paste. This together with the caramelized chocolate was probably what I was looking forward to the most so I was a bit disappointed, but at the same time I understand that it’s not always easy for the teacher which runs the school and the shop that sells chocolate making supplies herself; I think she’s working very hard and she can’t be expected to stay up all night if things takes longer than expected. In any case, I tried extra hard to pick up how to make the praliné paste because I was so interested in it; it basically involved grinding hazelnuts with sugar and mixing this with chocolate and then temper the paste. You need to temper it because it’s not an emulsion like ganache, it’s a fat system with a lot of cocoa butter. The course also involved making something called “cold mixed ganache” which seems to be the same thing as the slabbed ganache in Greweling’s book. Instead of letting the hot cream melt the chocolate you heat the chocolate to 40 degrees and mix it together with the cream that’s at the same temperature. This ganache tasted very nice and melted faster in your mouth than the other types of ganache we made, however, it was a bit more fiddly to make and it seems to split more easily than other types. Poires au Chocolat recently wrote about caramelized chocolate and I had an interesting conversation with her in the comment field. Valrhona claims that they were the first making caramelized chocolate and that it’s a complicated process that only they can do right. I’m not entirely sure if they really were but in which case they were indeed early with it. Teacher said that she first came across caramelized white chocolate at a “French baking blog back in 2009”. This blog turned out to belong to someone called David that went to a course held by Valhrona… Sometimes it feels like the world is a small place. No one can say that it’s hard to make caramelized chocolate, all you need is an oven tin and some white chocolate with a high cocoa butter content. You simply put the white chocolate in the tin and bake in the oven at a low temperature stirring every now and then until it’s a slightly darker beige colour and smells caramelized. If wanted you can stir in some sea salt, which breaks off nicely against the very sweet chocolate. We also tried to dip cut ganache with a chocolate fork, something that’s harder than it looks. This is something that I’ve previously overlooked but I realize that this method of making chocolates can produce a huge array of different styles. You can dip round truffles and then pipe a different coloured chocolate on top for a nice effect, you could make patterns on the chocolates with the dipping fork or you could decorate them with a gold leaf. An example of a chocolatier that doesn’t make any moulded chocolates at all (apart from big things like Easter eggs as far as I know) but instead is hand dipping chocolate centers is Artisan du Chocolat. I used to think that dipping things in chocolate wasn’t very advanced at all but it is, and many professionals are doing it. One perk of dipping centers is that you usually get a higher filling to chocolate rate which depending on what filling you’re using can be very nice. In between all of this we moulded or shells and filled them, as usual. We went overtime a little again and everyone wanted to make a few purchases in the supplies shop so it was quite hectic and confusing but I managed to pick up some more chocolate couverture (Tobago from Chocovic) as well as two chocolate moulds. All in all I think these courses are worth taking if you have a serious interest and can’t afford schools like Le Cordon Bleu or if you don’t have the time for it. It’s up to you what you’ll end up getting from the course in terms of knowledge, so make sure you pay attention and remember that even though you’re paying for the courses there is still hard work going on, so don’t expect a relaxing day with long sit down meals with some chocolate; be prepared to work hard or you’ll most likely end up missing something. I’ve learnt a lot from these courses and I’ll practice at home for a few months and then I’ll most likely return. I’ve ordered a chocolate scraper (the last tool I needed!) 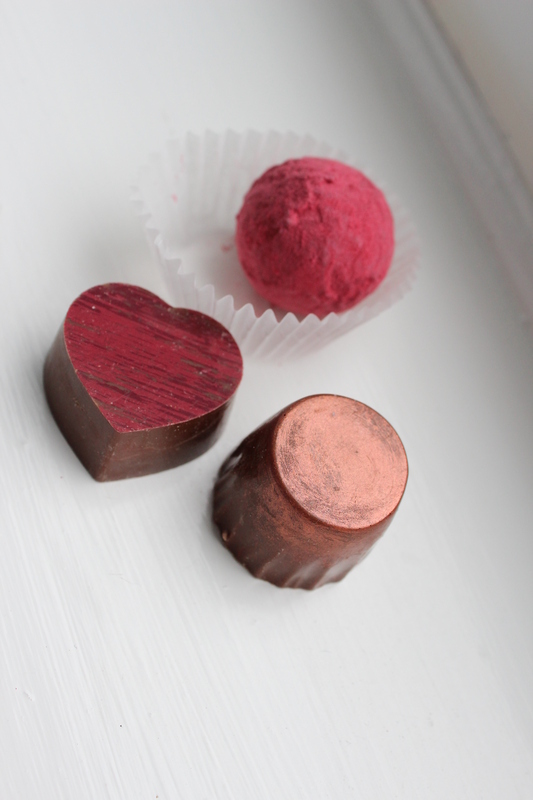 and if it arrives this week then I’ll hopefully make my very first own batch of artisan chocolates this weekend! This is what the caramelized white chocolate looked like. The moulds ready to be filled, the one to the right is a magnetic one with a transfer sheet in it and the one to the left is a normal mould with lustre dust painted on it, for a nice effect. This entry was posted in Chocolate, Chokladskolan and tagged chocolate, Chokladskolan, Nora. Bookmark the permalink.